ACP's outgoing president reflects on her past year, milestones the College has achieved, and what future goals remain. ACP is clearly seen as a leader across “the house of medicine.” Over the past year as your president, my counterparts at other professional societies have routinely indicated great enthusiasm about working with ACP on the big challenges in American medicine. In some cases, these exchanges have grown into substantive discussions. In October 2013, a productive meeting with the American Gastroenterological Association led to an invitation to write a guest article for the association's newsletter on optimizing patient care between internists and subspecialists. I received several appreciative notes from gastroenterologists thanking the College for this engagement. Other relationships with professional societies have been more contentious but are nonetheless exceedingly important. In December 2013, Annals of Internal Medicine published an ACP guideline recommending against screening nonelderly adults without risk factors for kidney disease with either a urine albumin or, of importance, a serum creatinine test. Nephrologists, meanwhile, have spent the past 10 years developing a framework for categorizing individuals of all levels of renal function and dysfunction and have emphasized to physicians that we should look for chronic kidney disease, stages 1 to 3, in all our patients and list it as a diagnosis when we find it. This, of course, requires obtaining a serum creatinine in large numbers of asymptomatic patients. The reaction of the nephrology community to the ACP guideline was immediate, vociferous and negative. Several College leaders who are nephrologists played an important mediating role, and the conversation continues. Both ACP and the American Society of Nephrology have the best interests of patients and the public at heart; we just differ in our perspectives on balancing benefits and harms. We will be meeting soon to better understand each other's positions and, I hope, to develop an approach to guidance in this area with which both groups are comfortable. Of course, the College has a number of critically important relationships in the area of medical education. ACP is a core member of the Alliance for Academic Internal Medicine (AAIM), a relationship of importance to all our members, including nonacademicians, because AAIM's constituent groups include the Clerkship Directors in Internal Medicine and the Association of Program Directors in Internal Medicine. In addition, this year the College reached out to the National Hispanic Medical Association and is developing co-produced educational programming with the National Medical Association, consonant with our commitments to collaboration and workforce diversity. Unfortunately, like any family, we have some difficult relationships as well. I suspect all readers of ACP Internist feel some frustration about the escalation in complexity, expense and burden of the American Board of Internal Medicine's (ABIM) Maintenance of Certification process. Let me take this opportunity to remind anyone who is still confused that ACP and ABIM are 2 entirely separate organizations. Rest assured that the full extent of your ire, expressed to us as your membership organization, is being conveyed to ABIM. We have been hopeful that it will be possible to develop some more flexible and practice-relevant approaches to the necessary periodic assessment of physician competence, but we also appreciate some of your suggestions about alternate approaches to MOC. The College is engaged with health care stakeholders well beyond health professional societies. The Healthcare Roundtable, our forum for interactions with leaders in the health care industry, is co-chaired by the College president and an industry leader, who this year is Christopher Dezii, RN, MBA, CPHQ, from Bristol-Myers Squibb. In an increasingly interdependent and complex environment, relationships with all stakeholders are important but must be thoughtfully designed and managed. The Healthcare Roundtable is focusing on collaborations in the area of adherence, a long-time interest of the College's and a very suitable domain for shared work. Patient-centeredness is the watchword of the day, and expressing this concept meaningfully in the College's programs requires new relationships as well. 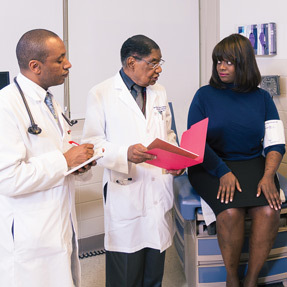 The College's new Center for Patient Partnership in Healthcare, established in 2013, will bring the voices of patients and their families into the heart of the College's work, ensuring that we benefit from the expertise and perspectives of groups such as the National Partnership for Women and Families and the Consumers Union. This year we also collaborated with the AARP, contributing the physician perspective to a series of 4 web-based town halls on the rollout of the Affordable Care Act, which included thousands of participants. As we build “patient-centered medical homes” and “patient-centered medical neighborhoods,” we continue conversations with our nurse and nurse-practitioner colleagues that were significantly advanced by the College's “Principles supporting dynamic clinical care teams,” published in the Nov. 5, 2013, Annals of Internal Medicine. I believe we will continue to see expansion in the roles of professional and nonprofessional clinical colleagues, including such partners as community health workers and our front-desk administrative staff. Broadening clinical roles is required to bring down the cost of care. While changing relationships can be difficult to adjust to, they also allow physicians to focus on the intellectually complex care and technically demanding procedures that we went to medical school to provide. My travels over the past year have shown me that the seismic shifts we have experienced in U.S. health care are occurring internationally as well. When I met in the fall with leaders of the European Federation of Internal Medicine, we discussed the changing role of physicians vis-à-vis other clinicians. At January's meeting of the ACP Central America chapter in Panama, thoughtful, evidence-based medicine and careful stewardship of resources were themes across all the presentations. The College's work in the political arena necessarily involves alliances as well. In November, several professional societies met with Rep. Ami Bera, MD, FACP (D-CA-7) to consider the most effective response to “legislative interference,” the growing tendency of legislators and regulators to mandate and prohibit particular conversations in the exam room and at the bedside. This work has included, among others, the American College of Obstetrics and Gynecologists, the American Psychiatric Association, the Society for Adolescent Health and Medicine, the American Osteopathic Association, and the American Association of Family Physicians. At the American Medical Association (AMA)'s fall meeting in November, ACP skillfully led a process that saved AMA's support of a framework designed to repeal the sustainable growth rate (SGR) formula. Just 2 weeks ago I attended a meeting with Reps. Eric Cantor (R-VA-7) and Kevin McCarthy (R-CA-23), followed 2 days later by a meeting with Sen. Harry Reid (D-NV), at which Charles Cutler, MD, FACP, Chair of the Board of Regents, represented the College, trying to find a way through. At the time of this writing, SGR repeal is locked in a partisan impasse about budgetary offsets. But however it turns out, medicine stood together and the College played an essential role in developing and sustaining that unity. It has been my privilege to serve as your president over the past year. Among many other benefits, the presidency has allowed me to observe the great respect your College garners from many different spheres. I don't believe another organization holds a candle to ACP in this regard. I hope that you are proud. For hypertension, how low to go?